Can Pokerstars Break The Record For Largest Ever Poker Tournament on December 28th? December 28th, 2008. 15:30 pm ET. 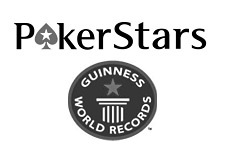 This is when Pokerstars will attempt to land in the Guinness Book of World Records. The record that they are trying to break? In accomplish to accomplish this task, Pokerstars is adding an additional $150k to the prize pool. The prize pool will be a GUARANTEED $500k. The buy-in will only be $11. That's right - you'll have a chance to play for the first place prize of approximately $100k for just $11. There will very likely be 35,000 players taking part in the tournament. Pokerstars has capped the field size at 35,000, and there is no reason to think that the tournament won't be full. The potential return on investment is just too high to ignore, plus the tournament is taking place during the holidays. The tournament will feature 10-handed tables and 10 minute levels, which will make it a turbo tournament. There are currently 3,715 players registered in this tournament so far, and the tournament doesn't even start for 11 days. Even if you can't afford the buy-in, there are literally hundreds of $2.20 satellites into the tournament. If you still can't afford the buy-in, then borrow some money from a friend. You don't want to miss out on this tournament. If you are even considering playing in this tournament then I would strongly advise registering now. If you wait too long, then you just might find that the tournament has been filled to capacity. Where else are you going to get an opportunity to play for $100k in exchange for an $11 buy-in? I think that Pokerstars will have no problem filling this tournament to capacity, and I wish everyone that is planning on playing the best of luck.